In this, Louisiana's bicentennial year, UL Press releases MAIN STREETS OF LOUISIANA, celebrating some of the state's most historic and picturesque downtown areas, the 33 communities participating in state and national Main Street programs designed to restore and rehabilitate deteriorating central commercial corridors. From Abbeville to Winnsboro, Louisiana's Main Street communities are all so different--the earliest established along the rivers and navigable bayous, the railroad communities stitched together by tracks laid across the treeless prairies, the commercial corridors of parish seats circling courthouses--and yet all of them are passionate about restoring the historic downtowns that were and are the hearts and souls of their communities, proving that preservation and progress can--indeed must-- stroll hand in hand without trampling each other. Some of these local communities have been so successful in restoring economic viability to their historic downtowns that they have received national recognition for their efforts. Author Anne Butler has a passion for preserving Louisiana's unique and fragile history and culture in print, a passion matched by that of photographer Henry Cancienne's determination to preserve our vanishing landscapes and vintage structures in images. The two have collaborated on several books, most recently LA 1, celebrating Louisiana's first interstate roadway, a book that in a single year went into three printings. Butler lives in St. Francisville, where she writes and runs a Bed & Breakfast on her family plantation, Butler Greenwood Plantation. Cancienne is from Lockport in south Louisiana's bayou country and is an Air Force vet who has retired from several careers, as a longtime teacher and chemist in the oil industry. 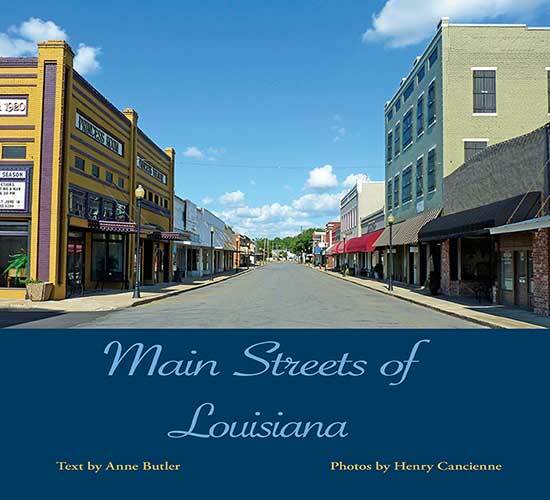 MAIN STREETS OF LOUISIANA, with wonderful full-color images of every community, is available in bookstores and other local outlets, as well as from UL Press, Box 40831, Lafayette, LA 70504; telephone 337-482-1163, online www.ulpress.org. Cost of the hardback book is $35. The author and photographer will be appearing across the state at numerous book signings and lectures. Anne Butler can conduct tours combining the history of Butler Greenwood Plantation with book reviews, since many of her books are set right on the plantation.